ADDRESS: 1922 S. Meridian St., Tallahassee, FL 32301. Southwest of Meyers Park, south of downtown between Meyers Park and S. Monroe Street. South of Cascades Park. LIVING AREA SIZE & ROOMS: Single Family Home. Living Room open to Dining Room. Kitchen open to Dining Room. Hardwood Floors throughout; Tile in Kitchen, Baths and Laundry. Window Blinds throughout. About 1056 Sq. Ft. Heated and Cooled. SECURITY DEPOSIT: $825.00. This is not the Last Month’s Rent. Property Manager visits monthly to pick up the rent check and change the HVAC filter. PARKING: Parking for Two Vehicles. 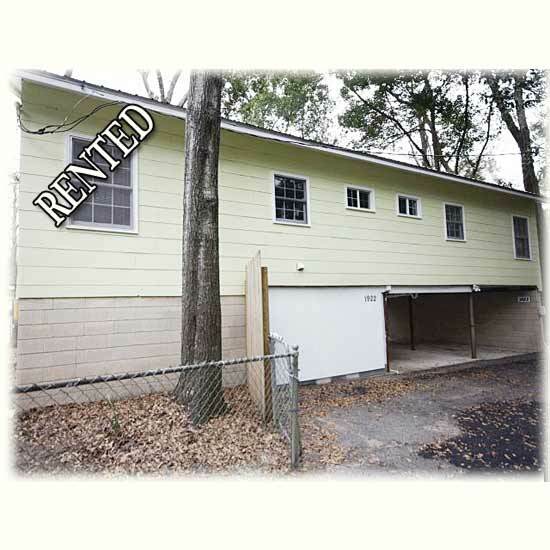 AMENITIES: Two Car Carport and approximately 400 SF of enclosed Storage Room. Convenient to Downtown. Meyers Park and Cascades Park nearby. Content is © Copyright Joan H. Raley, 2010-2015.